Attorney General/U.S. Senate candidate Jon Bruning committed his first big gaffe of the Senate campaign by comparing welfare recipients to raccoons scavenging for beetles. 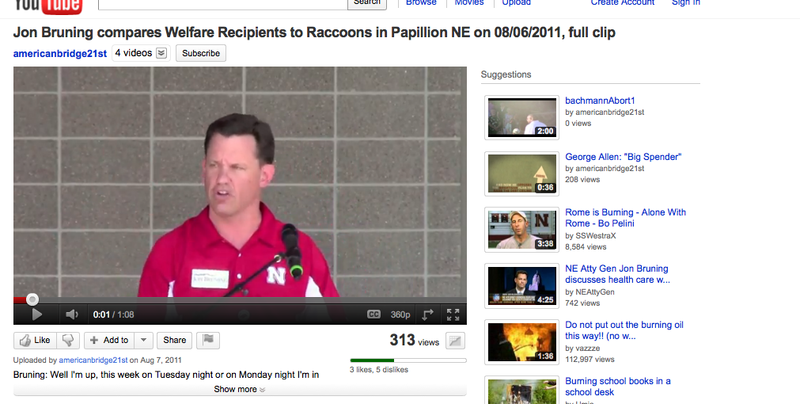 A video released by talkingpointsmemo.com catches Bruning on tape in a Husker red polo telling an aw-shucks-I’m-just-like-you-Nebraskans story about how a road project got shut down by the discovery of endangered beetles. He said the construction workers sat out buckets with dead rats in them to attract the beetles, and then the beetles were caught and released into the wild. Bruning said a farmer noticed raccoons eating the beetles at night — and compared the situation to welfare recipients taking the easy way out. It’s no accident that Bruning was caught on tape making a controversial statement. He was zinged by a group called American Bridge 21st Century, which was created specifically “to track Republican candidates with the aim of capturing just these types of gotcha moments on camera,” according to the Huffington Post. And it’s not unusual for higher profile campaigns to send videographers to press conferences and campaign events to try to catch the competition saying something crazy. Welcome to the wild, web world. his words if he wants to be elected. All politicians should also. Now the question is – Will Don Stenberg and Deb Fisher refute his statement, or back him up? I believe the welfare system to be greatly flawed. My husband had an accident shortly after I became a stay at home mom, hence no income. He was out of work for 4 months. We attempted and did recieve assistance for 4 months so that our 2 children were fed. i didn’t work do to the amount of time spent in doctors offices during this time. To make a long store short my husband had a simple IRA which was worth at that time about $3000. We all know if it was taken out we would only recieve aprox $2000. Well due to this fact that I had made available to them on more that one occasion. My family is stuck paying the assistance money back. ALL $2700 + back. But a drug attic or person that just pops out one kid after another to stay on assistance can recieve assistance with out any recourse or being taught where babies come from or sterilazation. Welfare reciepients for the majority are like Varmets. I don’t like to be stereotypical but if the shoe fits. Jane you are right. He was just relating what the welfare system has created. I believe that one should have to do somthing to get welfare. Also for every cild born to a welfare mom they take money away, don’t make it an insentive to have more children. Jesus, I can’t believe the idiocy any mention of welfare brings out in people. Firstly, the Raccoons aren’t being lazy, they’re being clever at worst, innovative at best. They’re taking advantage of a fortunate opportunity, this isn’t something that makes them lazy, it’s something that allows them to have adapted and survived as a species. Secondly, does ANY conservative out there actually know what the current welfare system is like? They all seem to have the same, mythical, false (even pre-Welfare-to-Work, which was like 15 yeasr ago) idea of the program. hint: it’s not some giant free money for everyone giveaway, it’s targeted, and complicated and barely covers necessities. I would agree to an extent that it’s not good for someone without the means to reproduce, but taking that aid away only harms the child, keeping them under-educated, malnourished and more likely to repeat the mistakes of their parents. I doubt any imaginary welfare mother is out there popping out kids just for the (tiny) WIC baby food credits and the lucrative opportunity to send their kids to head start. Welfare is fine (it should be increased, but is fine), it’s not a drag on tax dollars (unlike old people on social security and medicare). It’s really just become a buzzword used by moulth-breathers like Bruning (who, apparently entraps himself in his own prepared remarks) since the 60s to get a rise out of gullible voters, and apparently, unbelievably, it still works. Anyways, it’s not a big gaffe, it’s more offensive that he made such a political speech in an outfit that’s traditionally is worn with an Alltel headset and laminated sheet of offensive plays. Why should welfare provide anything more than the necessities? So conservatives all are too rich to know anything about the current welfare system? I may be that “any conservative”. First of all it’s not just one thing that they recieve. If they are eligible for welfare that also means they are also on housing. This allows them to have a house or an apartment for as little as $50 to $100 rent. They are also on food stamps, which if they have kids, will be between $300 to $400 a month. If they do have any type of job or just tell the state that they are “looking” then the state will hand over title 20 daycare which will give them free daycare. So you say that the welfare checks are minimal and “barely cover necessities”. Well, what necessities are not already covered? At this point the welfare check is just another check for extra spending money. I used to work in the social work field and I literaly would listen to parents tell me that they turned down job offers cuz it would cause them to lose all of these “services” and that they said it wasn’t worth it. I had a much more “compasionate” heart toward the welfare system unitl I actually saw how it worked and saw how people abused it. When you put the word “services” in quotation marks it makes it sound like a winking double entendre. Anyways, you make welfare sound great. Please sign me up and impregnate me so I can live in swanky public housing, get daycare and food stamps! However we should all remember that Bruning time and time again has shown by his comments (he later apologizes for, which makes it all better) who he is really out to represent! Not the lower or middle class, not women who need assistance during their pregnancy or those who may or may not come to this country legally! I think his comments are not “gafs” they are his true feelings about certain segments of our society and he is only sorry he got “caught” showing his true colors! Yes, I am not a fan of his, I have worked closely with him and his office for years, and have heard him make such comments over and over again! I only wish I had a recording device with me just to show who he really is!